On Monday April 10th, Jimmy DeLaunay was invited to talk about AMON at the Primordial Universe and Gravity (PUG) seminar series, hosted by the IGC. 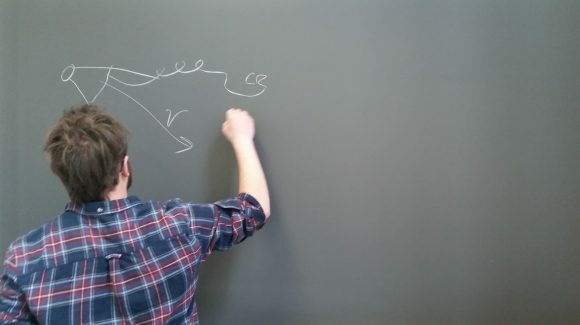 He gave an overview of the motivations for and current status of multimessenger astronomy, including details about the search for cosmic particle accelerators and IceCube’s recent discovery of the diffuse astrophysical neutrino flux. He then spoke about what and who AMON is, explaining AMON’s goals of using realtime subthreshold data from observatories across the world to search for multimessenger signals and from what observatories we’re getting that data from. In the last section of the talk he covered the data analysis techniques used by AMON published in recent archival studies and how they will be altered and used in the upcoming realtime phase of AMON.